By Charles Boehm – LOS ANGELES, CA (Jan 19, 2017) US Soccer Players - For many attendees at the 2017 NSCAA Convention, it was one of the most eagerly-anticipated sessions on the sprawling event's packed schedule... and that's saying something. 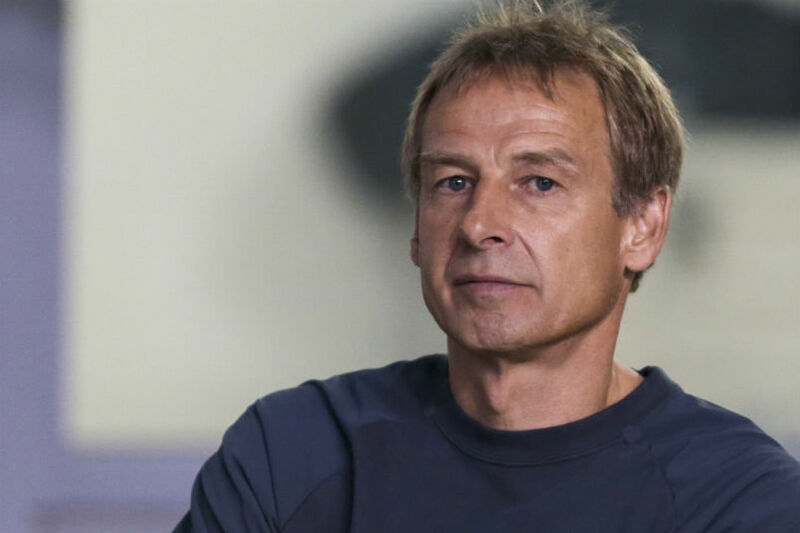 Jurgen Klinsmann visited the Los Angeles Convention Center last weekend for an NSCAA spotlight session with his longtime attaché Allen Hopkins. It was his first public appearance since losing his job as USMNT head coach. His hour-long chat in a packed auditorium was an absorbing experience. It was a reminder of the lows and highs of his tenure as National Team coach. Klinsmann made clear that he plans to work again at some point. He gave no hints as to where, despite reports linking him to China's cash-flush league. He did show signs of frustration with the way his last job ended. He seems to have attributed his fate to his last two games in charge, rather than a wider trend of poor results. “I think in the world of soccer you're measured on results,” he said. “After a successful 2016 in [which] we reached the semifinals of the Copa America, at the end of the year two lost games – obviously two very important ones – at the beginning of the Hex, and then your federation decides to let you go. So when you have these moments of failure, I think it's really important to see, where does this decision lead towards? But this answer now I won't get, because it's now Bruce [Arena]'s job to get the job done. That version of history is certainly up for debate. He left it to others to decide if he was ultimately a success or failure. The implementation of his philosophies can be another matter altogether. Klinsmann has always been at his best when discussing big-picture ideas, and so it remains. Asked whether he would've reached his heights of world stardom had he grown up in the US, Klinsmann pointed to soccer's nagging cultural identity crisis. “The DNA of sports here is basketball, football, baseball, hockey. For our sport it is difficult,” he said. “Now the best talents in the world, the ones that we love so much, the Neymars and the Messis and the Ronaldos, where did they grow up? Basically they are inner-city basketball kids. That's who they are in their countries. And I was an inner-city basketball kid, probably, in soccer terms, in my country. So there's still a lot, a lot of opportunity out there for the game of soccer to grow – because we've got to take it to where the kids are. As so many of us learned during his topsy-turvy USMNT tenure, Klinsmann doesn't seem to distinguish between the voice required of a compelling television commentator and that of a national team coach. His anecdote about last summer's 4-0 Copa America Centenario semifinal loss to Argentina had most of the audience roaring with laughter. Then again, some USMNT fans might not find it all so funny. Klinsmann comes across as someone you'd love to share a beer with at a game. Whether he's equally capable of providing a high-level team with advanced tactical instruction is less certain. At their weakest moments, his US teams could look rudderless. At the NSCAA, there were hints as to why. “For me, when I came here I was a little bit overwhelmed with the kids all the time looking at us coaches – they want an answer from us to everything that happens out there. For me overwhelmingly was always the fact saying to the player: 'You solve it. You are the player. You've got to figure it out.' as coaches we put you in a safe environment, hopefully in a fun environment, hopefully the chemistry of the group that we gather is a good group of kids and players. But then it's a player's game. Klinsmann is comfortable in the spotlight and adept at connecting with his audience. On this occasion, he got a standing ovation as he left the stage. It's unlikely to be the last we see of him in the public eye. His hefty USSF contract gives him the freedom and flexibility to pick his next move carefully. We'll be talking about the legacy he left for the USMNT program for years and years to come.